September 21, 2019! An annual event on the 3rd Saturday in September – in support of Mennonite Central Committee! 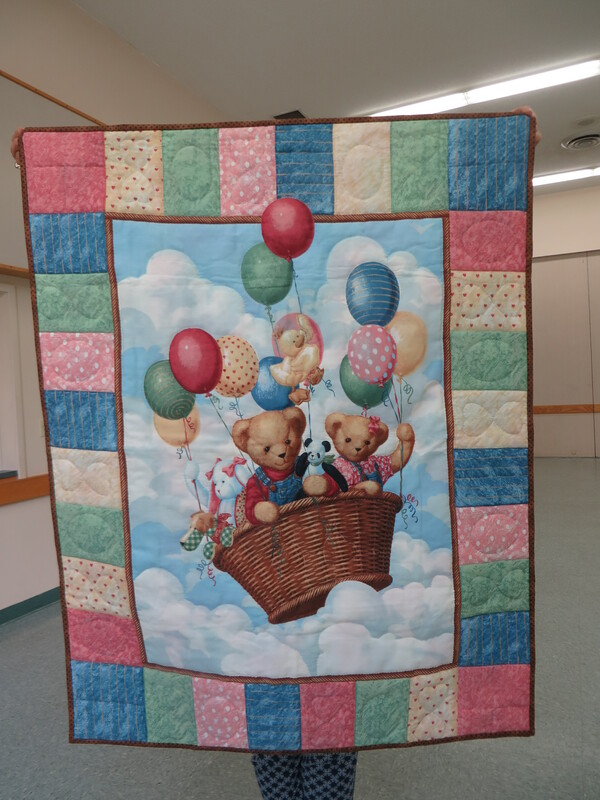 Here are the quilts that we promoted for the 2017 auction. Reminisce away! 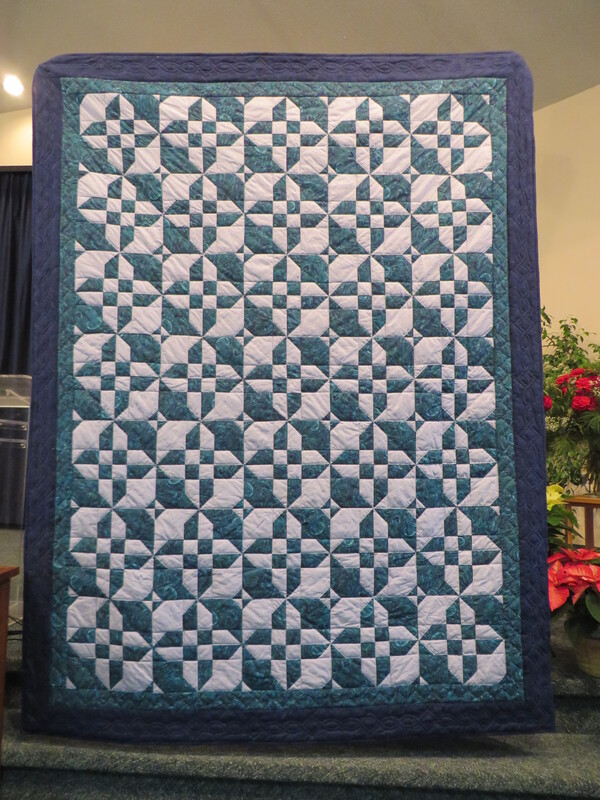 The quilt auction raises a lot of money for Mennonite Central Committee, and showcases the remarkable skills of the quilters. 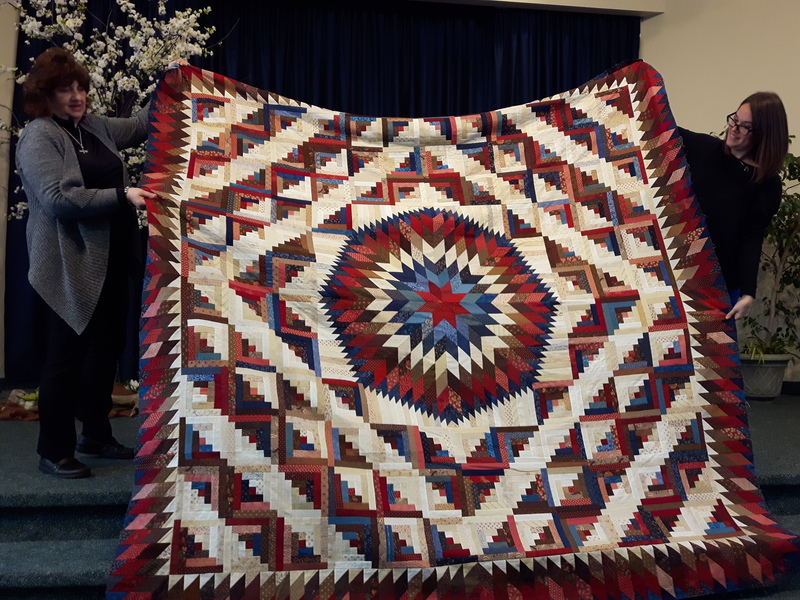 The Anniversary Quilt, unfinished, at the Toronto Mennonite Festival 2017 AGM. 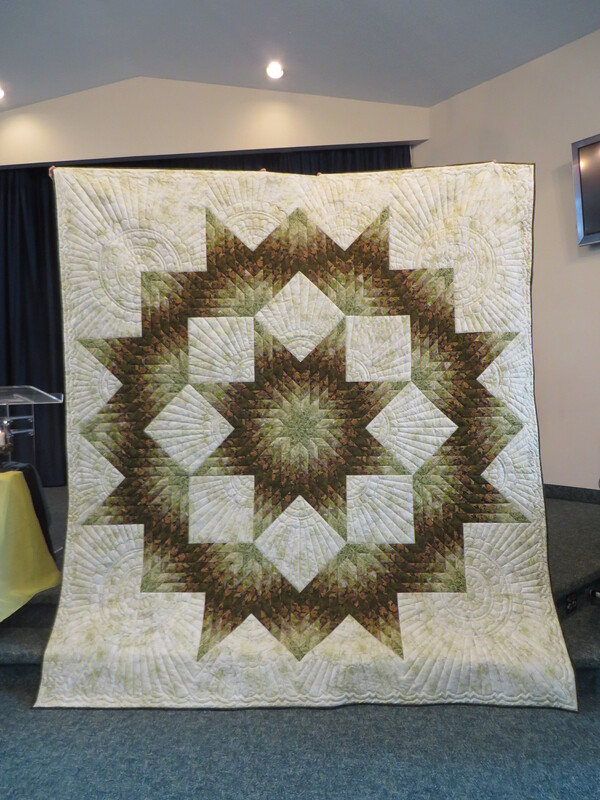 Here’s a first look at the completed 50th Anniversary quilt. It is a Sun Valley Log Cabin design, measured at 100×100”. 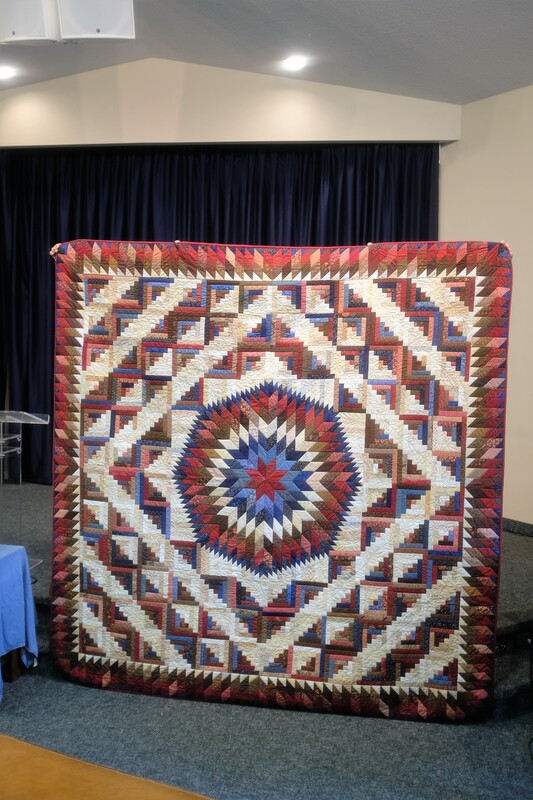 The 50th Anniversary quilt is a Sun Valley Log Cabin; 100×100”. People started working on the Anniversary Quilt in January 2017. It was completed on June 26. 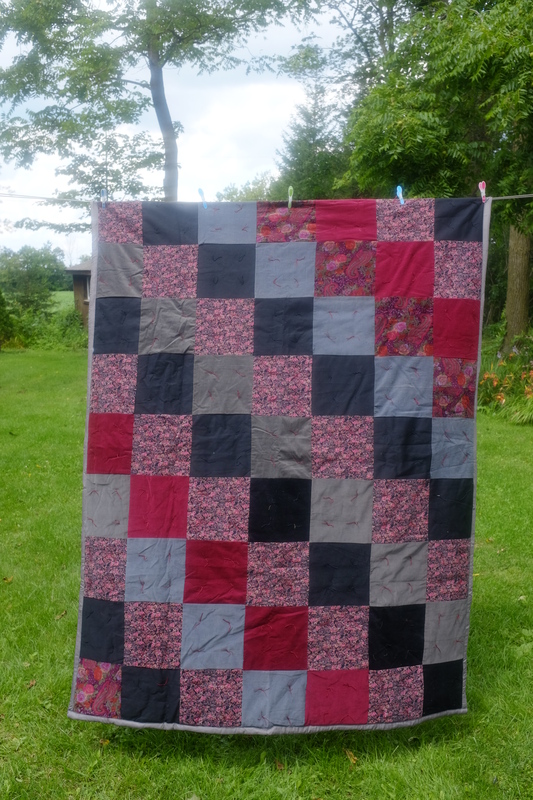 15 women pieced it; 24 quilted it. 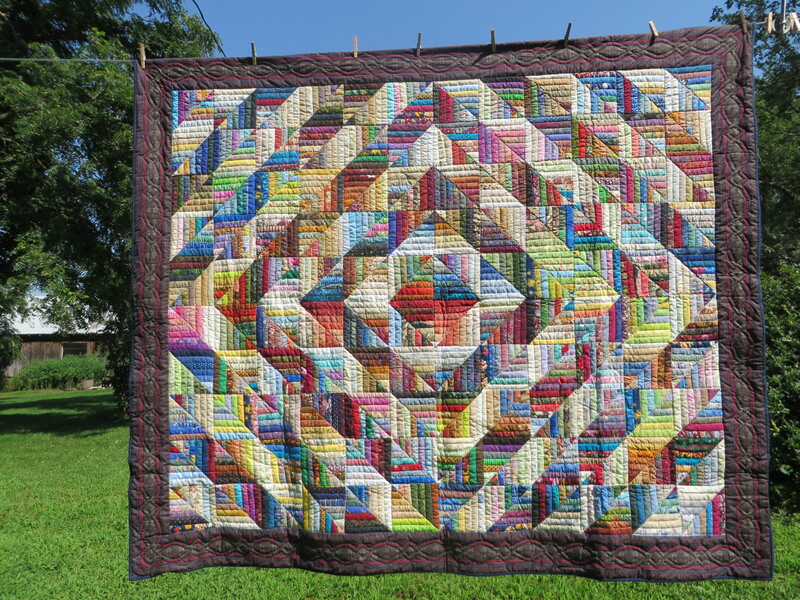 The quilting alone took 208 hours of effort. It was a community effort of several Mennonite churches in the Greater Toronto area. It combines two traditional patterns: Log cabin and Lone Star. 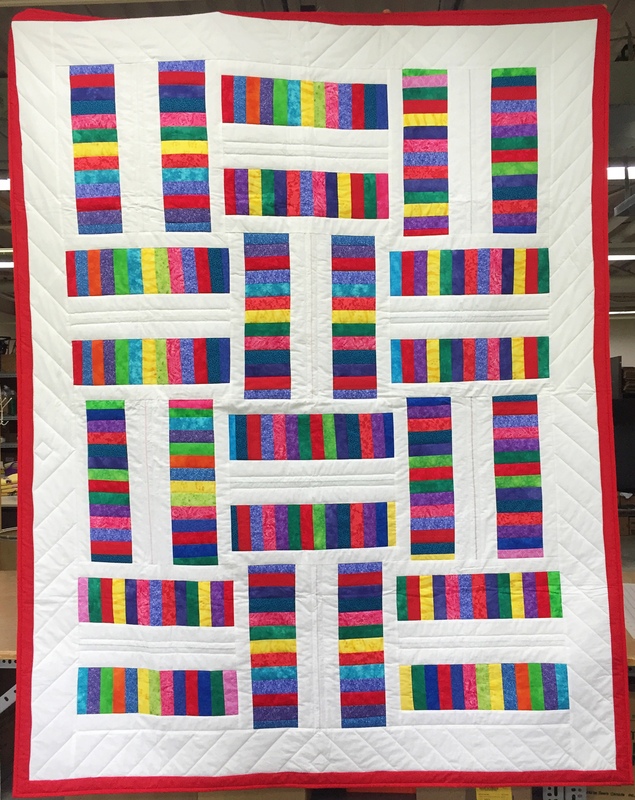 (end of 2017 Anniversary Quilt section). 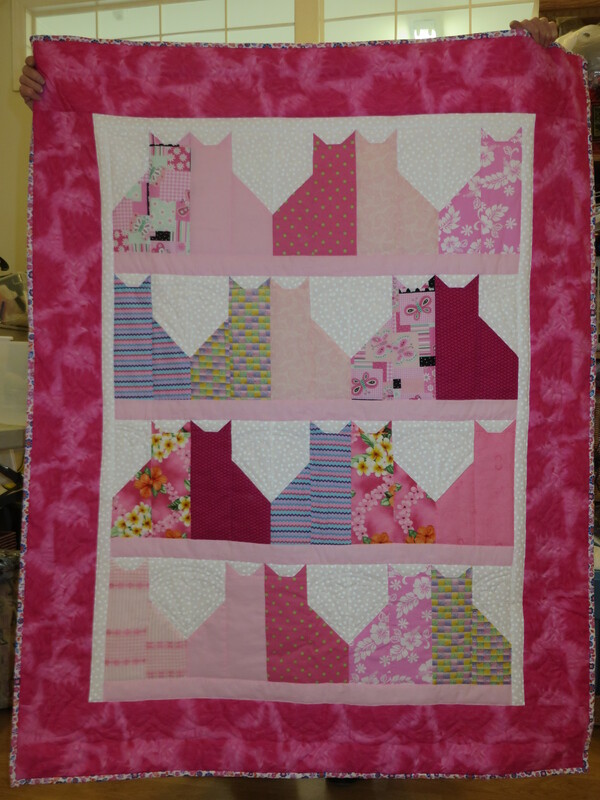 First is the Pink Cats crib quilt. It’s 42×53 inches. Next we have Neptune’s Garden, at 42½ by 65½ inches. 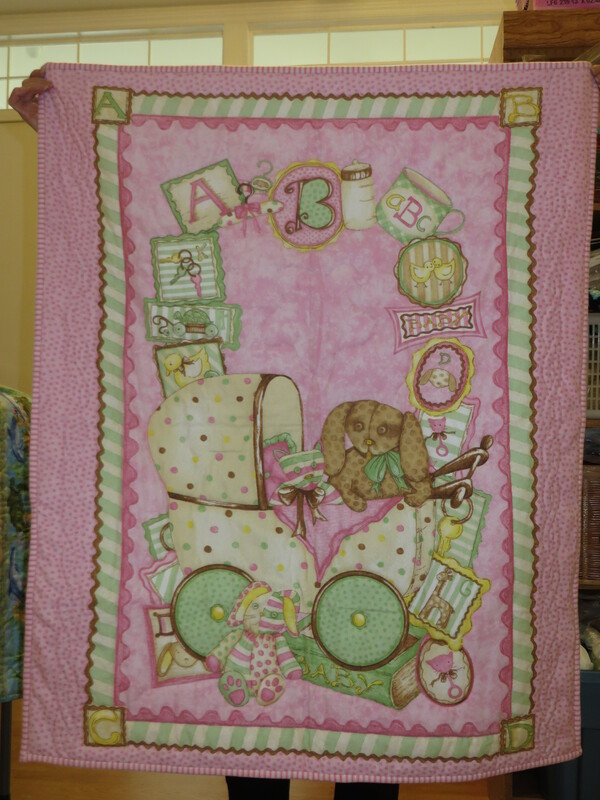 The final crib quilt is called Sugar Roll Toys. 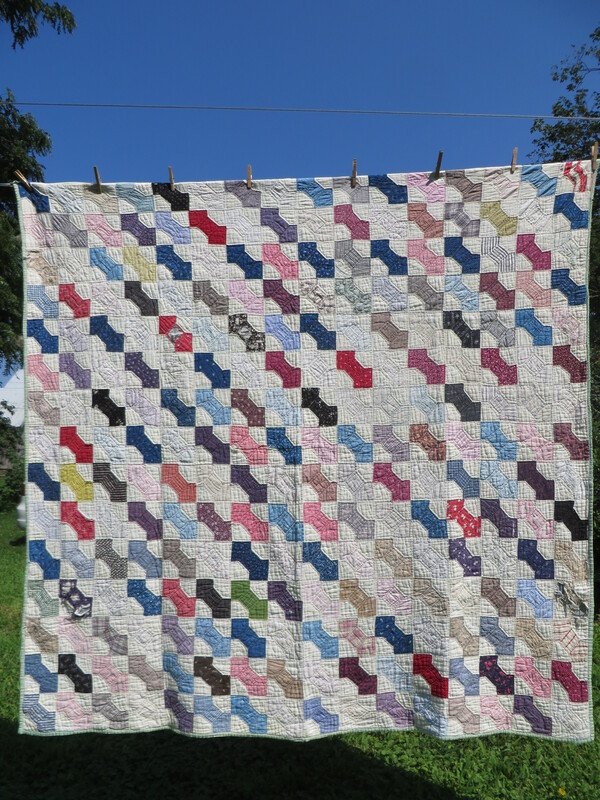 This 35×43 inch crib quilt has a flannel back. These are full-size bed quilts. 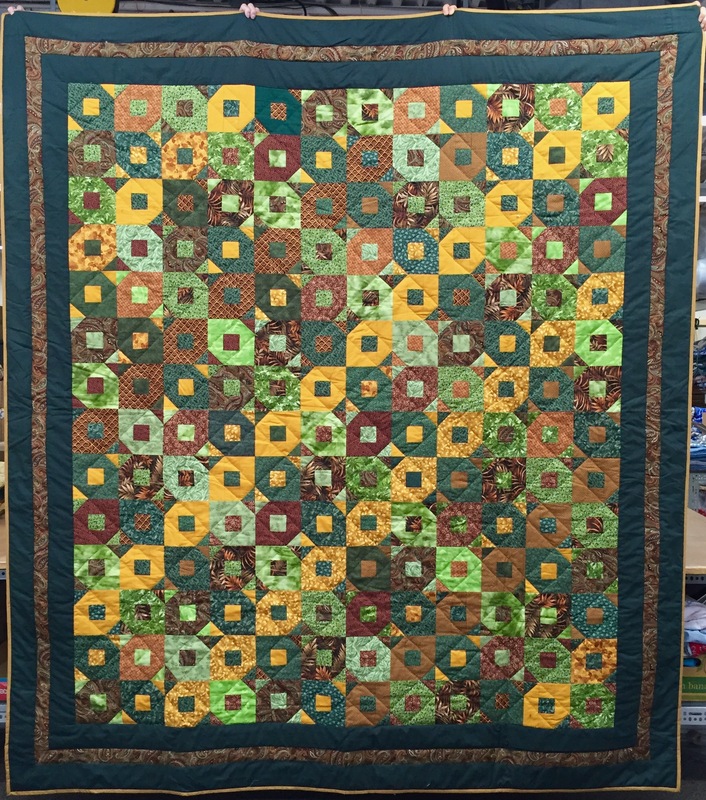 This Forest Floor quilt is 89×100 inches. 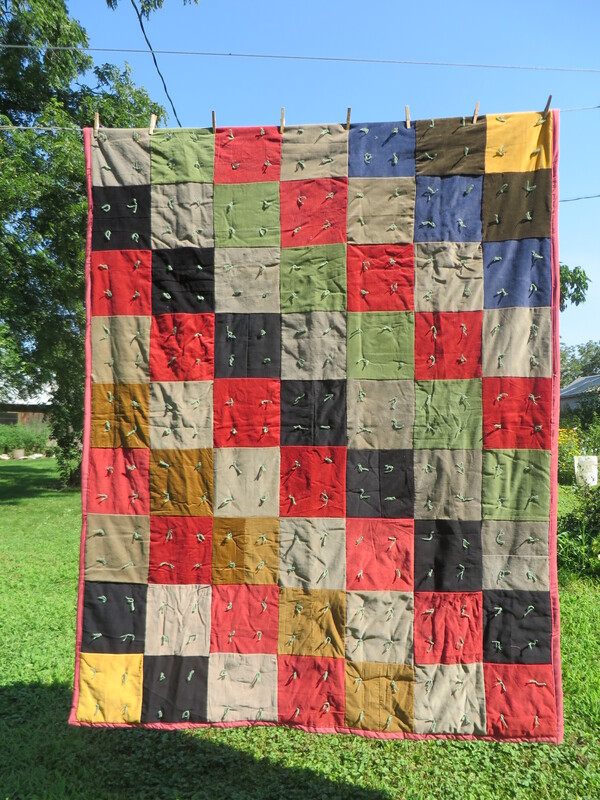 The literary Yellow Brick Road quilt is 90×90 inches. 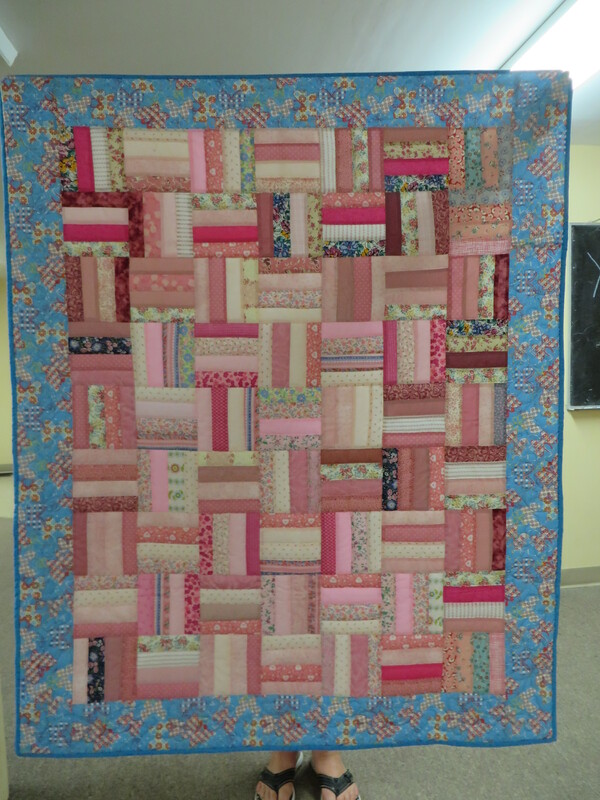 The colourful Candy Stripes quilt is 71×90 inches. 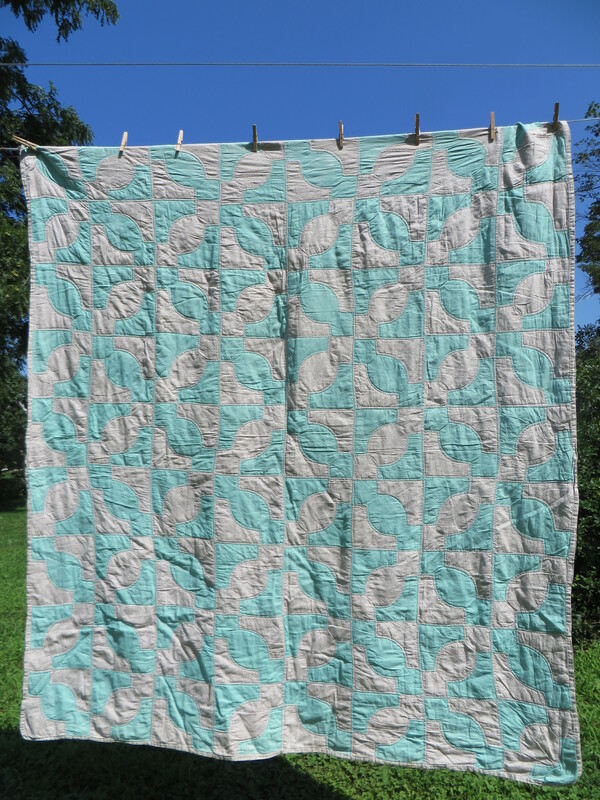 In a much cooler colour scheme, the First Frost quilt measures in at 60×80 inches. 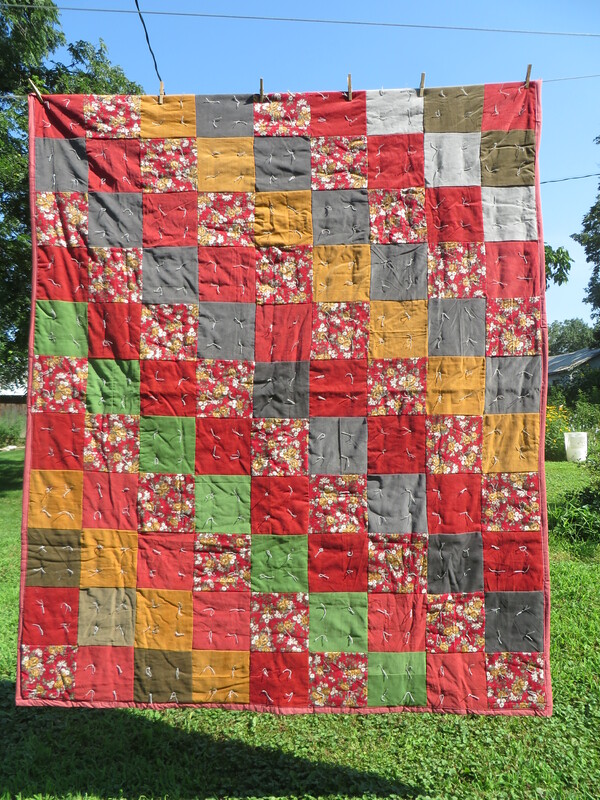 This Garden of Hearts quilt is 76×80 inches. Fans and Flowers, in darker hues, measures 70×89 inches. 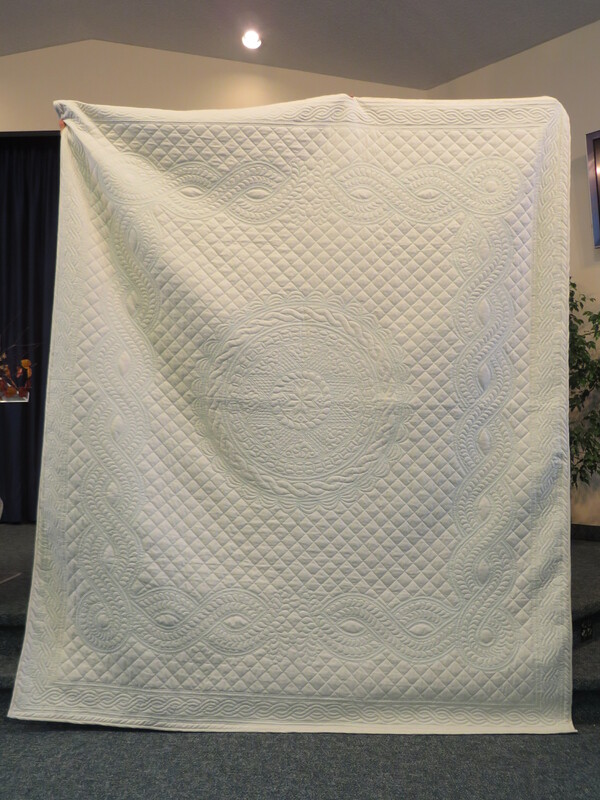 This Disappearing Pinwheel quilt covers 69×91 inches. 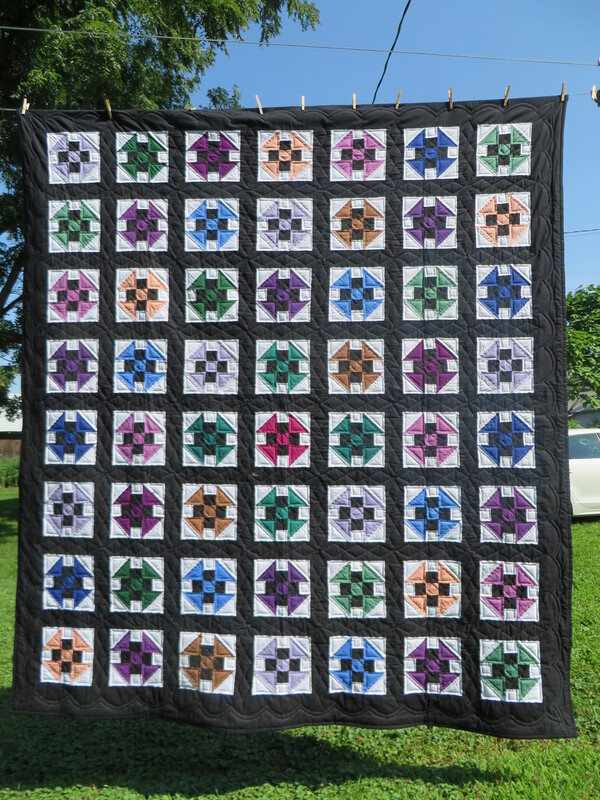 This truly remarkable Queen Anne Star pattern is a whole cloth quilt made with one piece of fabric. 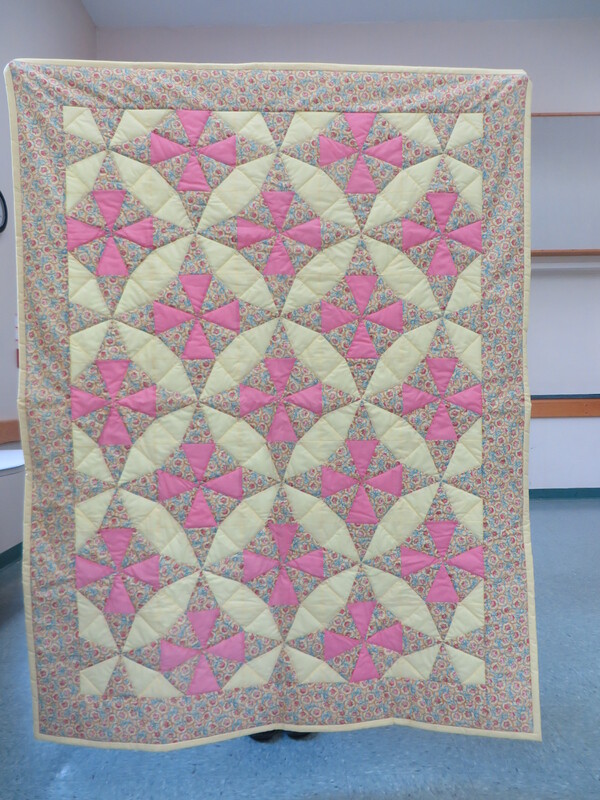 The design is made with the quilting. It measures 88×108 inches. 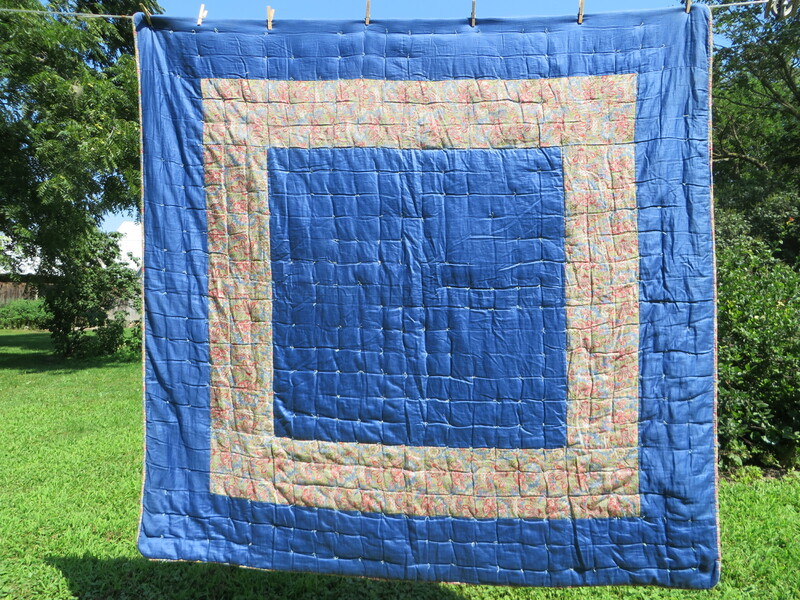 Queen Anne Star whole cloth quilt, 88×108 inches. A Broken Star patterned quilt returns for 2017. It’s 98×108 inches. 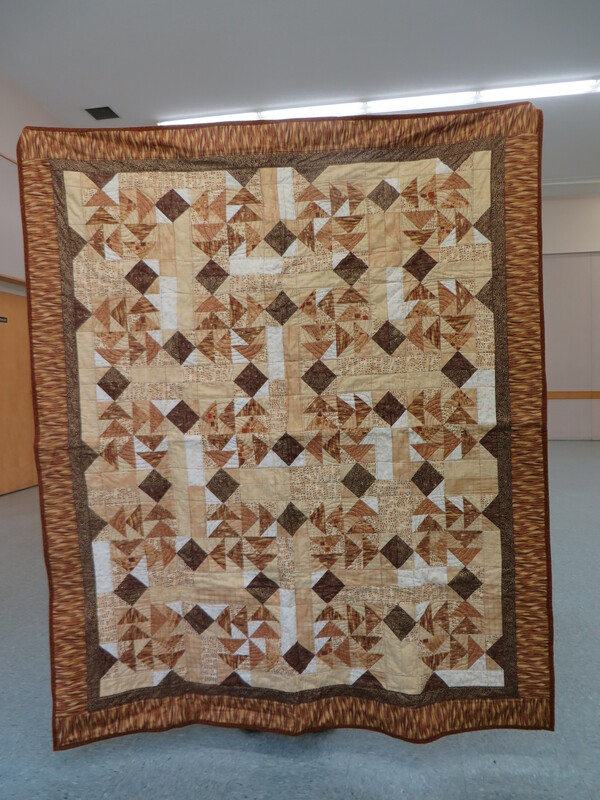 More quilts for the 2017 auction arrived in early August. 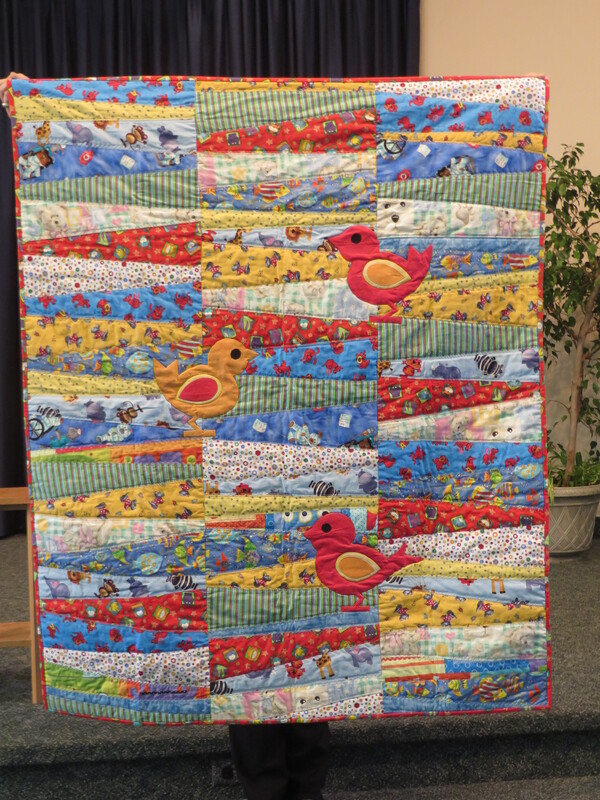 This Pieced Crib Quilt is a Rail Fence design, measuring 36×48″. Keep your eye on the prize! 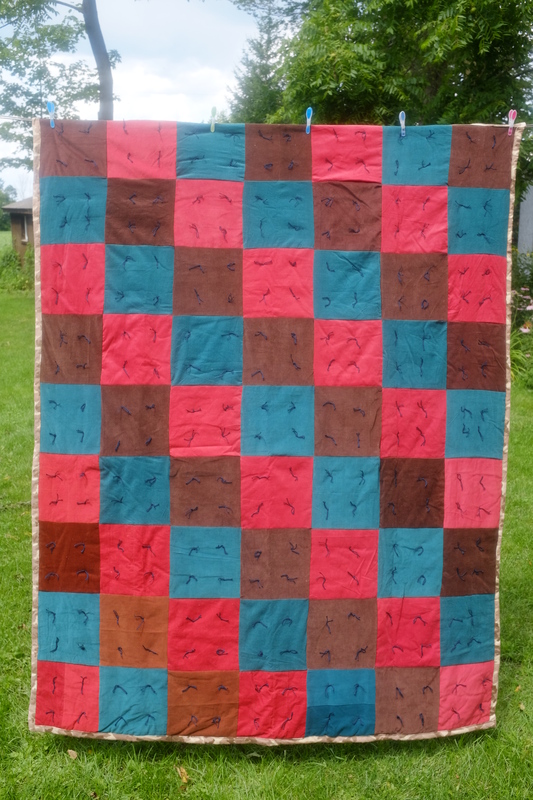 The Disappearing 9 Patch Crib Quilt, described as 50×63” and pieced. 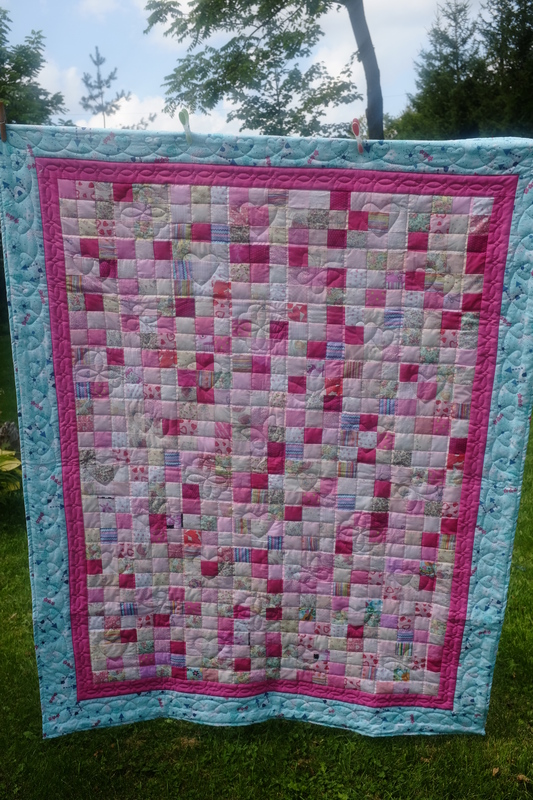 Here is a Fence Rails Crib Quilt. 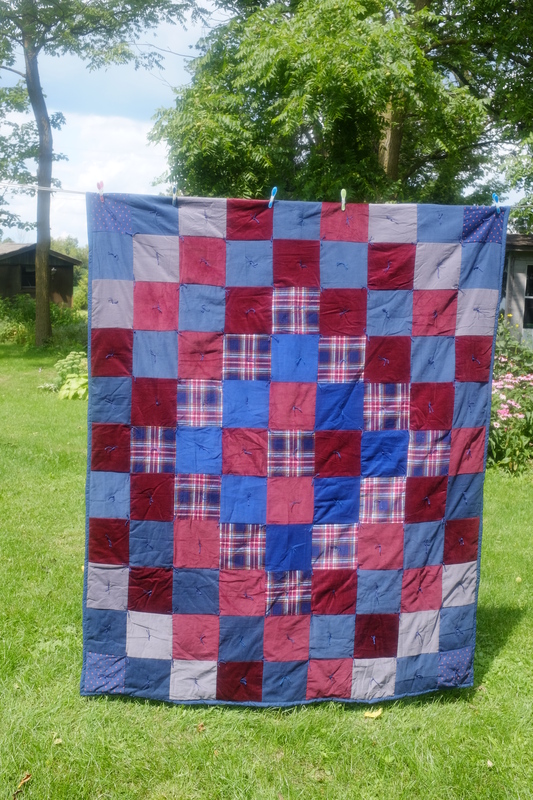 It’s pieced, and has a striking blue border with reddish interior. The size is 47×58”. 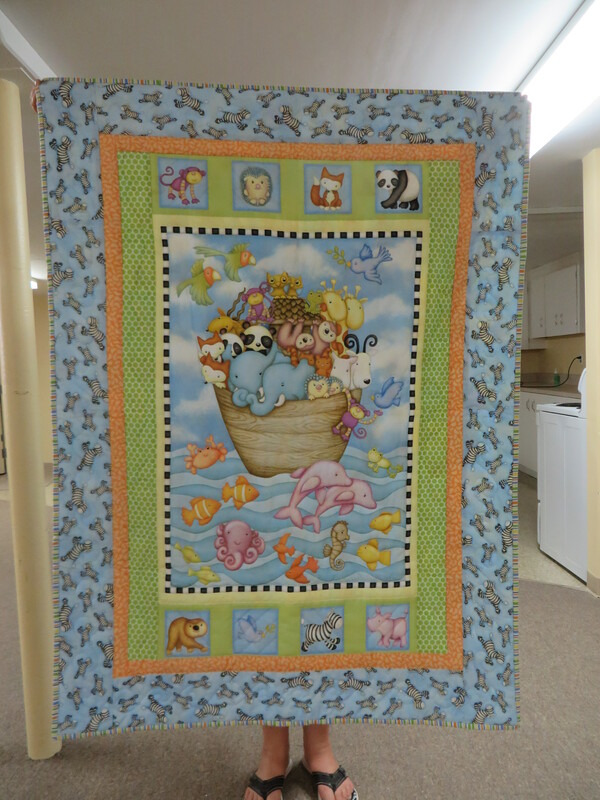 This Noah’s Ark Crib Quilt is 40×54”. The centre is printed material, while the borders are pieced. The next are lap quilts or wall hangings. 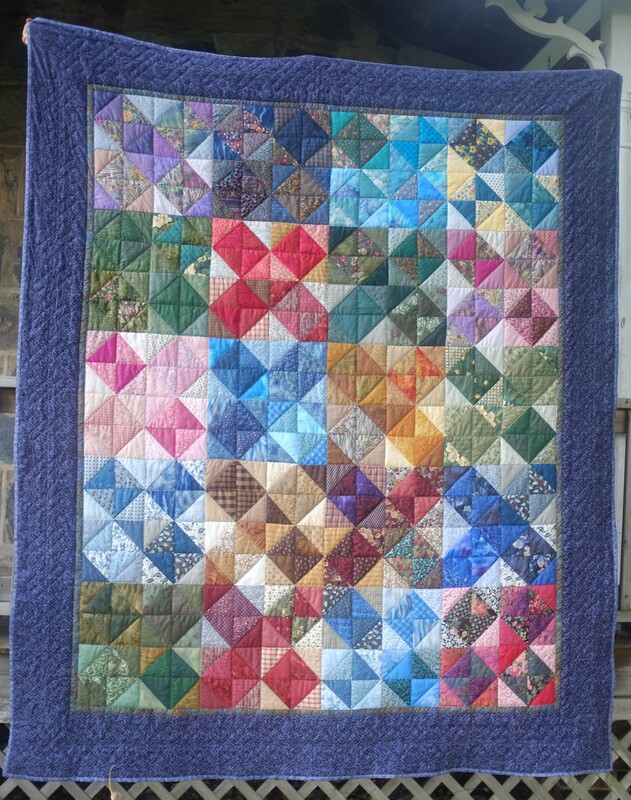 Perhaps the most striking colour and design for 2017, this Faceted Jewels pieced quilt measures 50×51”. Who can solve this Dutchman’s Puzzle? 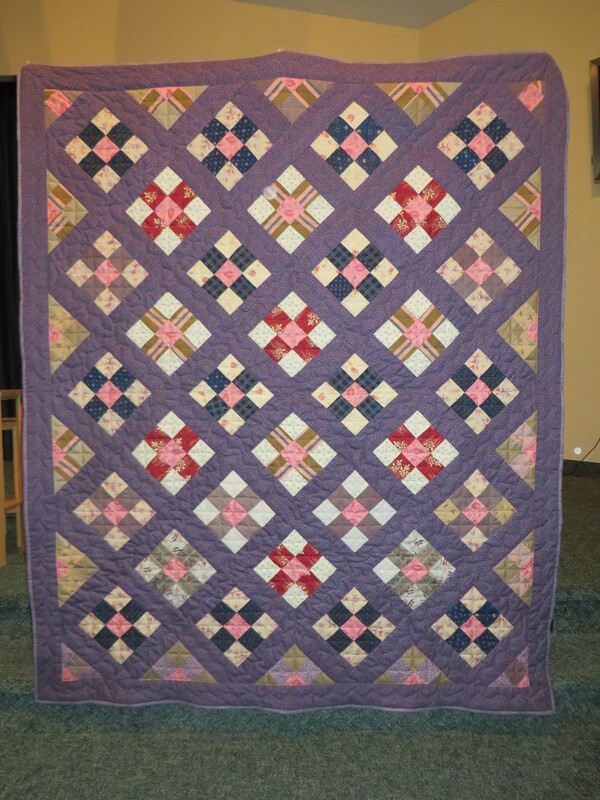 Measured at 54×66”, it is pieced and machine quilted, with a flannel back. 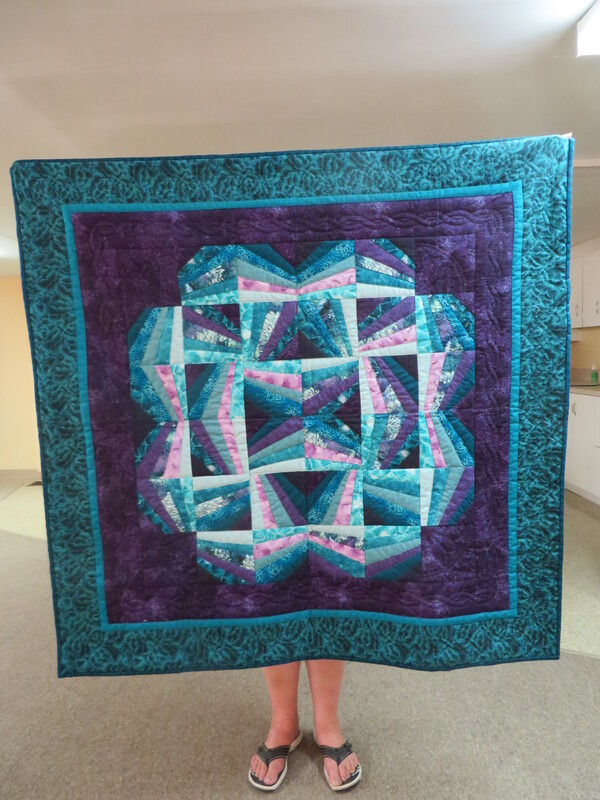 This Kaleidoscope Star quilt is 49×64“; it’s pieced and machine quilted. We’re back to childhood dreams. 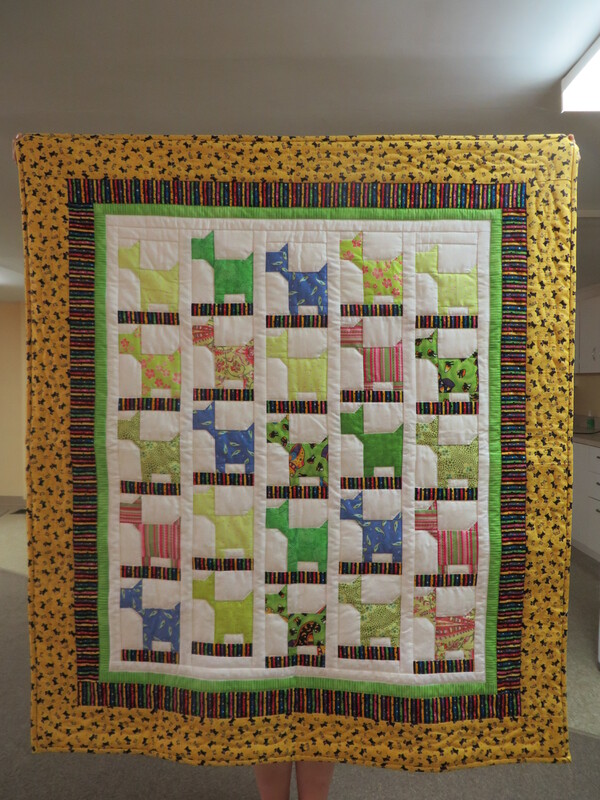 Here is Puppy Tales, a 41×47” pieced quilt. How about this adorable Teddy Basket? 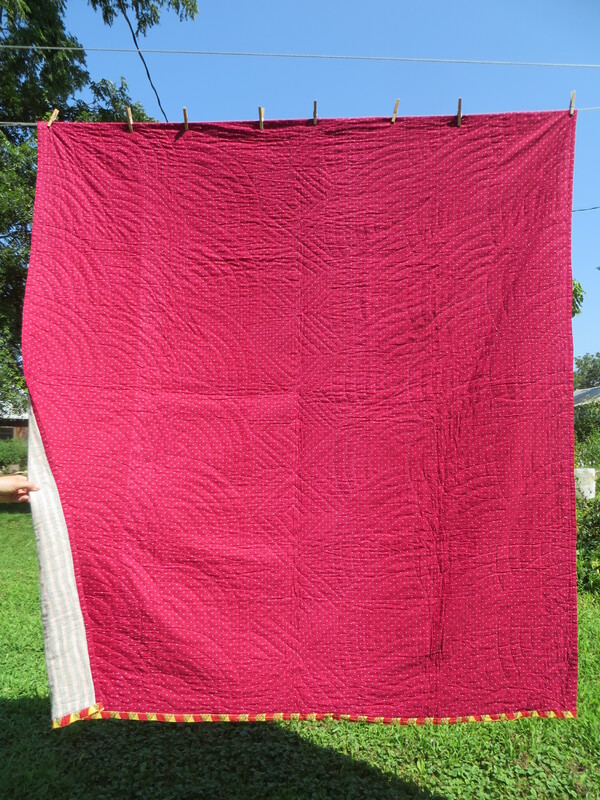 This 35×44.5” quilt has printed material. 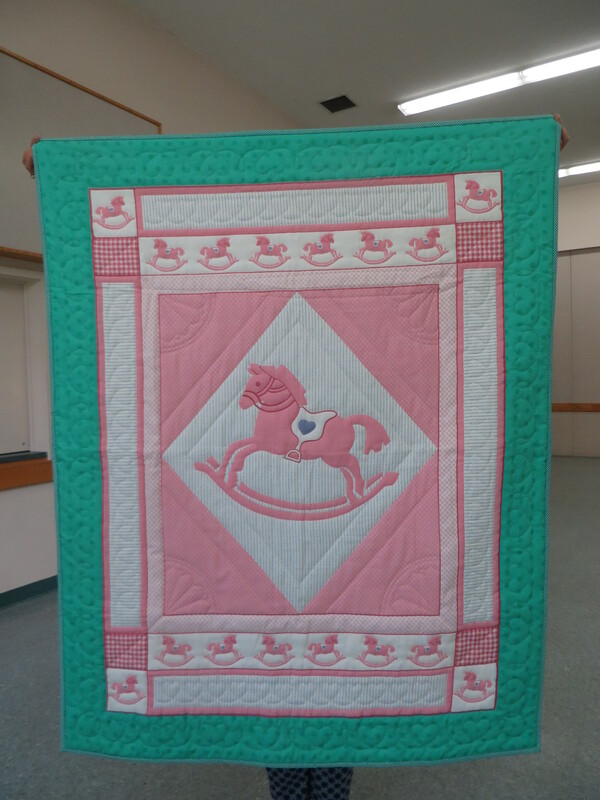 Here is a pink Rocking Horse quilt. 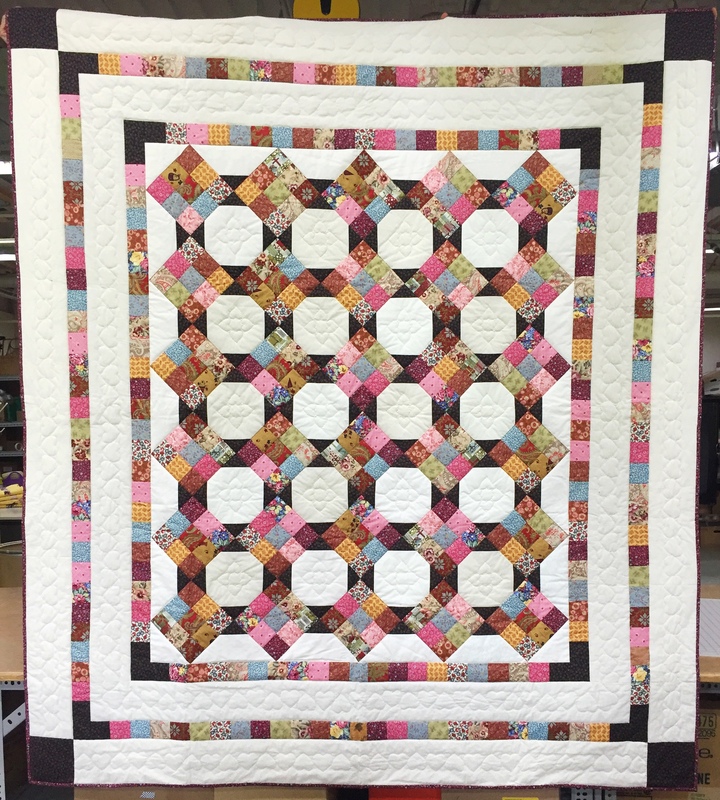 It measures 40×50”, and has printed material with a pieced border. 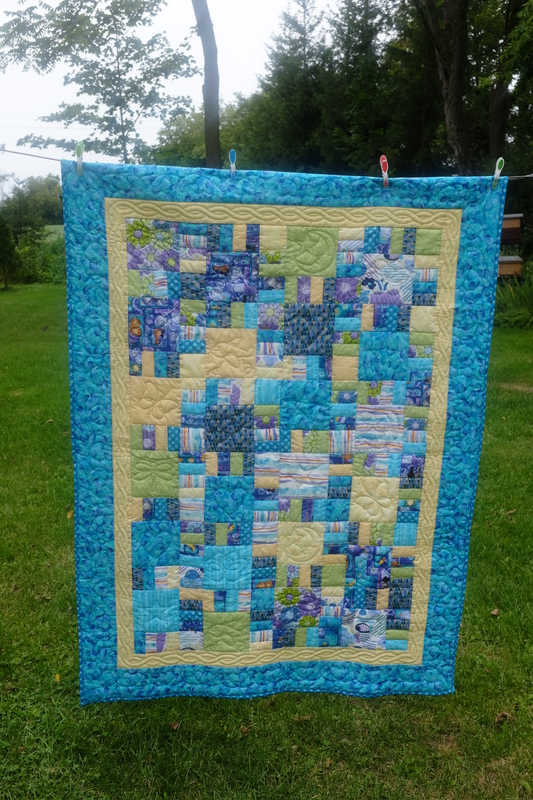 More quilt photographs arrived in my in-box just as I finished the above updates. 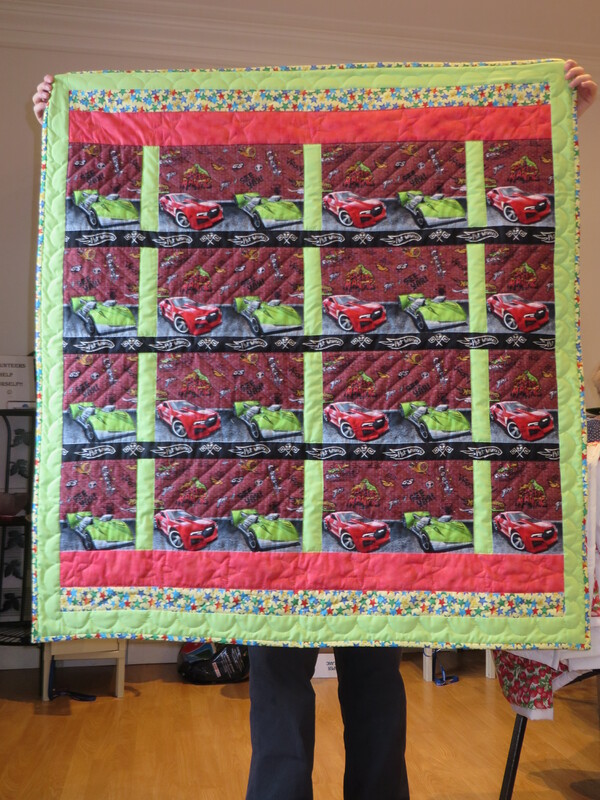 Here are Model Cars, 44” x 48” pieced. This is Dream, Love, Sing. It’s 34.5” x 47.5”, made of printed material with pieced borders. This pieced wallhanging is Colourwash Garden, a square 29×29”. Birds on the Scraps is 43×53”. 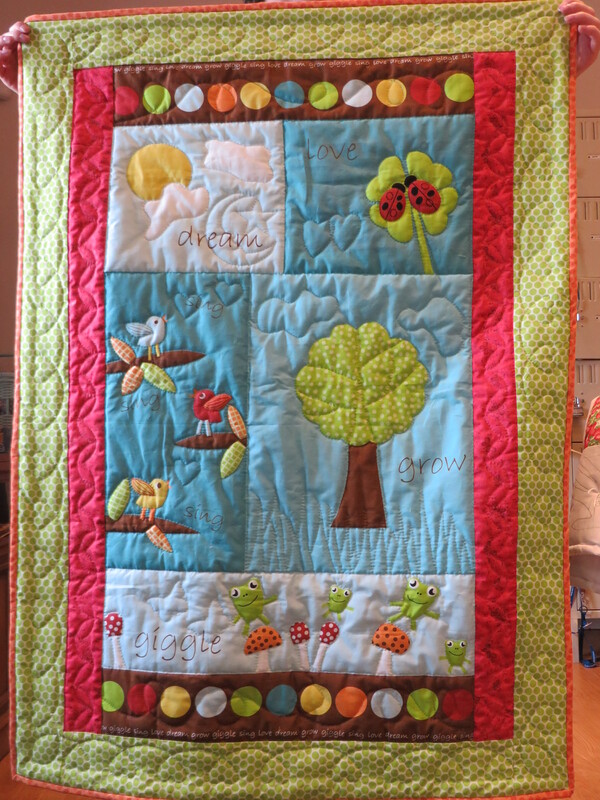 It is pieced, applique, machine quilted, and cotton batt. 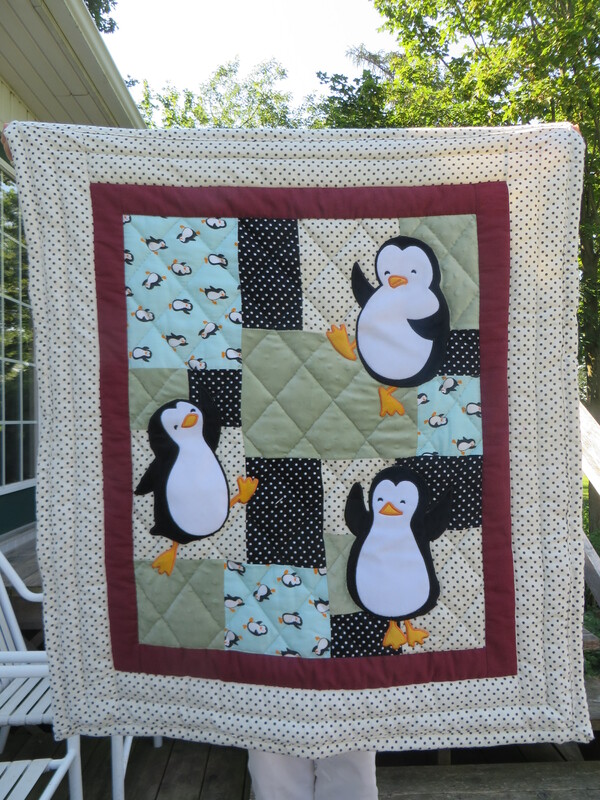 We go outdoors to find Penguins at Play in a 35.5×41.5”, pieced, applique, flannel back quilt. 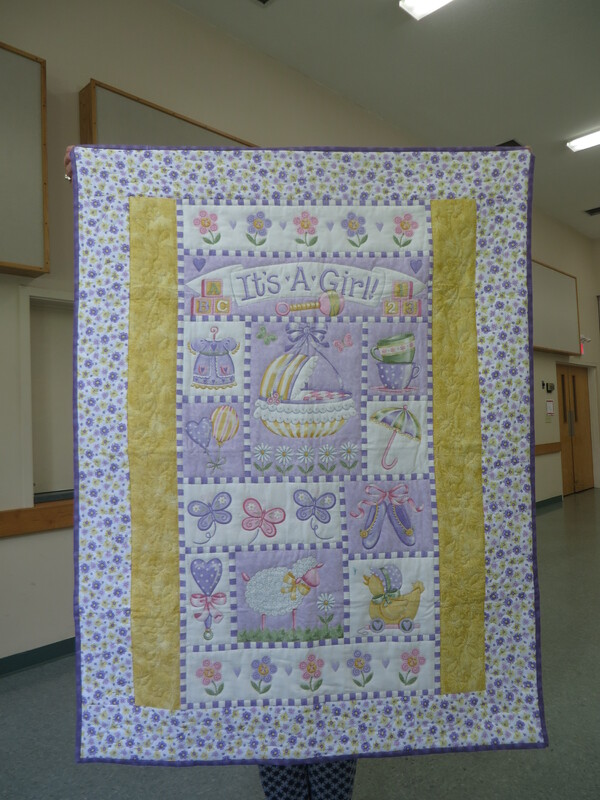 Here is a pieced Crib Quilt, 41×49”. 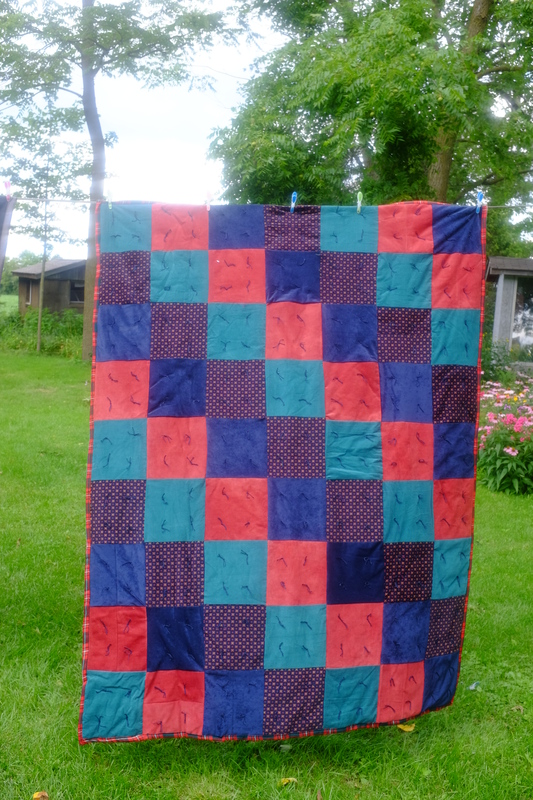 This Nite-Nite Quilt is pieced. It is a double size, measuring 68×74”. 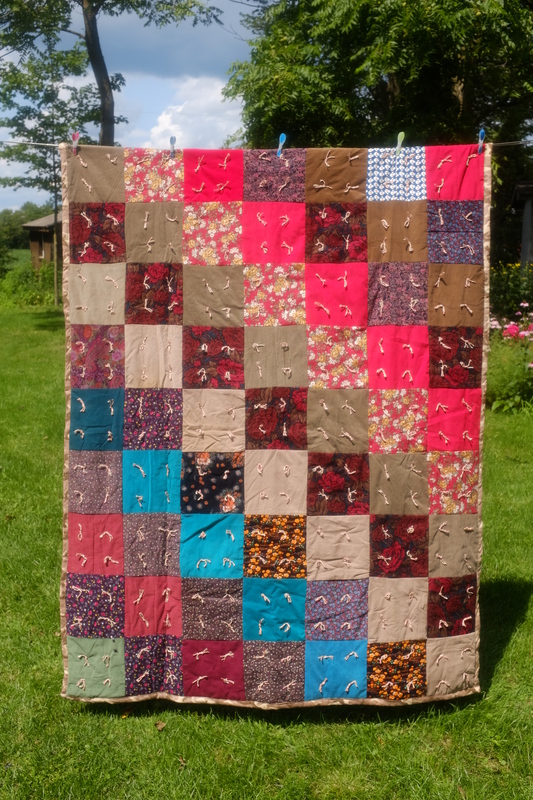 This pieced quilt with multi-coloured patches is 82×98”. Here is a tied Corduroy comforter. We have eight corduroy items in different sizes and colours. This is the second Tied Corduroy comforter. This is the third Tied Corduroy comforter. This is the fourth Tied Corduroy comforter. This is the fifth Tied Corduroy comforter. This is the sixth Tied Corduroy comforter. This is the seventh Tied Corduroy comforter. This is the eighth Tied Corduroy comforter. 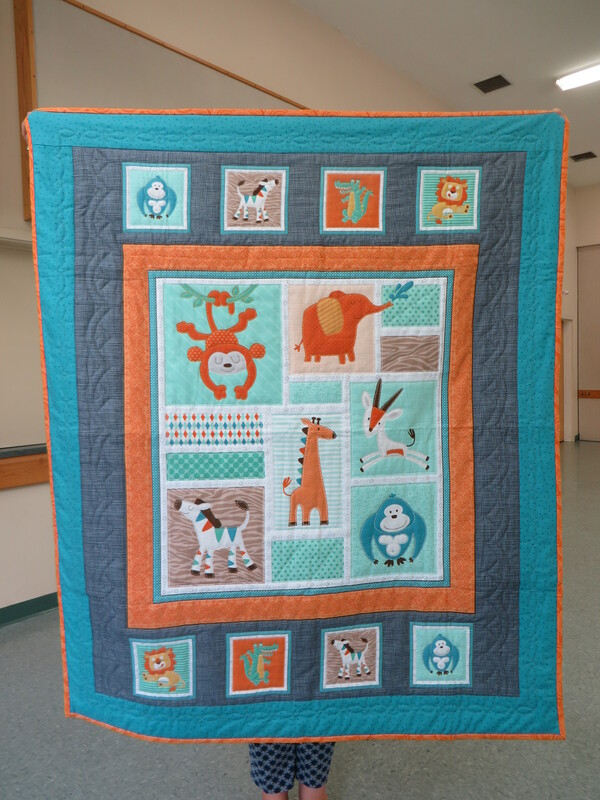 Let’s return to crib quilts, starting with Jungle Animals. 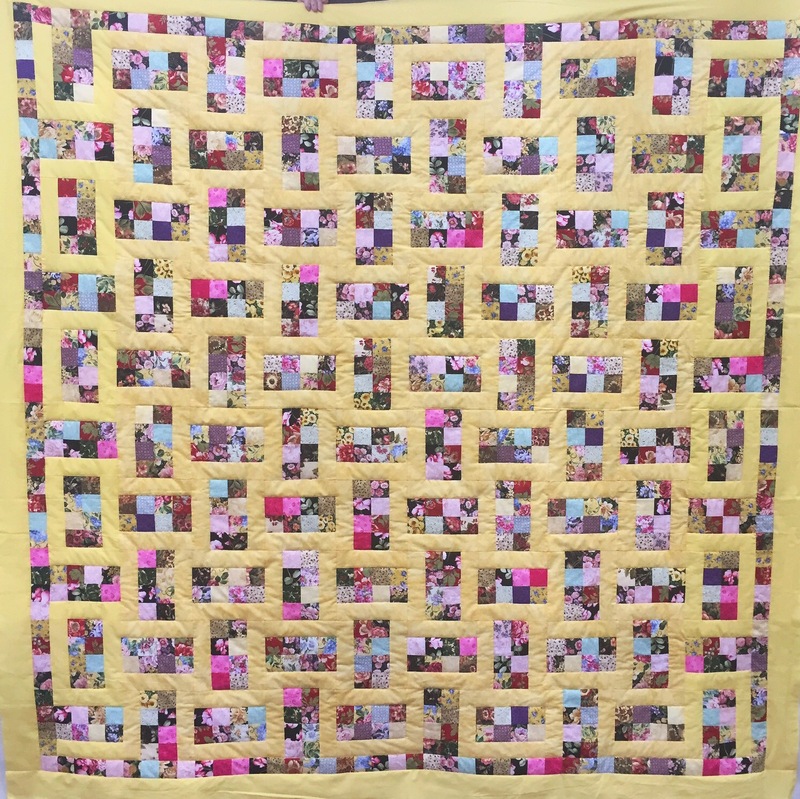 It is 41×49”: printed material, pieced border. 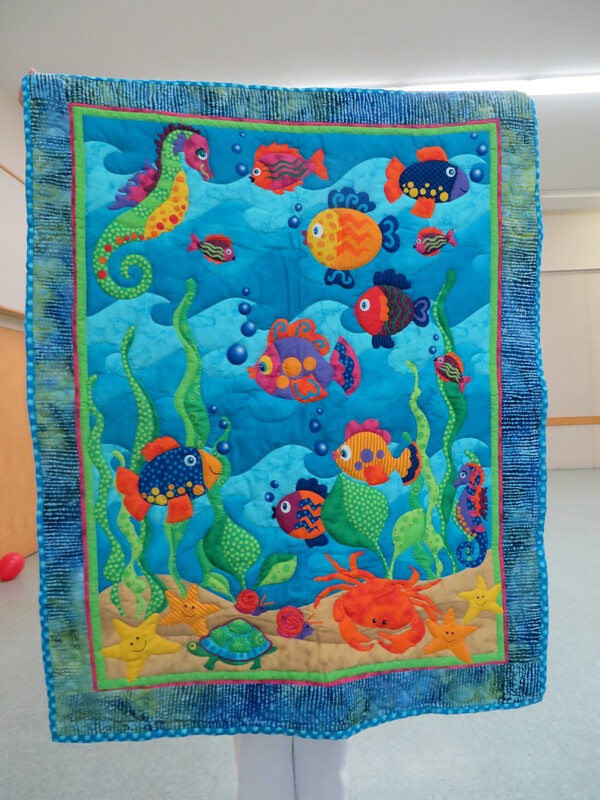 The next crib quilt is Underwater World. This is 36×46”, printed material, with a pieced border. 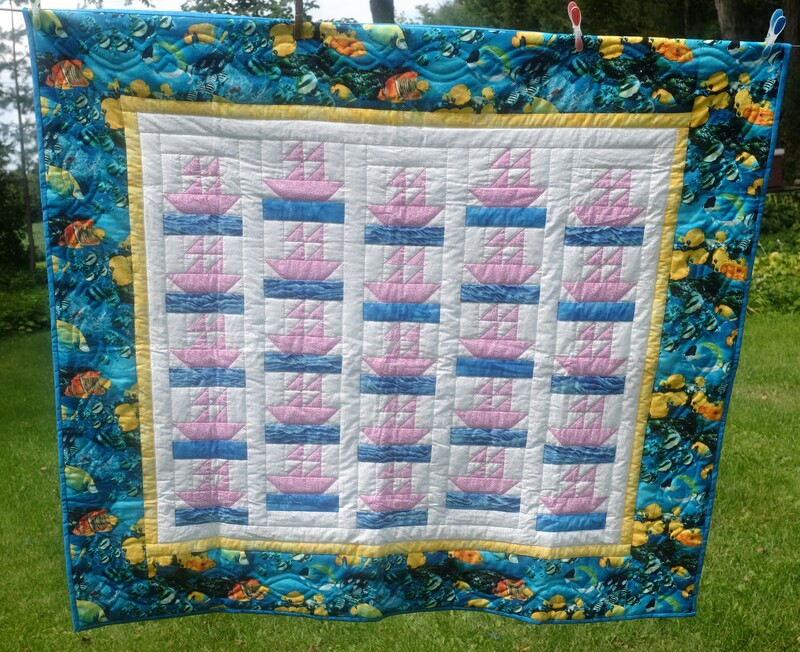 The Ships Ahoy crib quilt measures 42×49”. It also is made of printed material, with a pieced border. 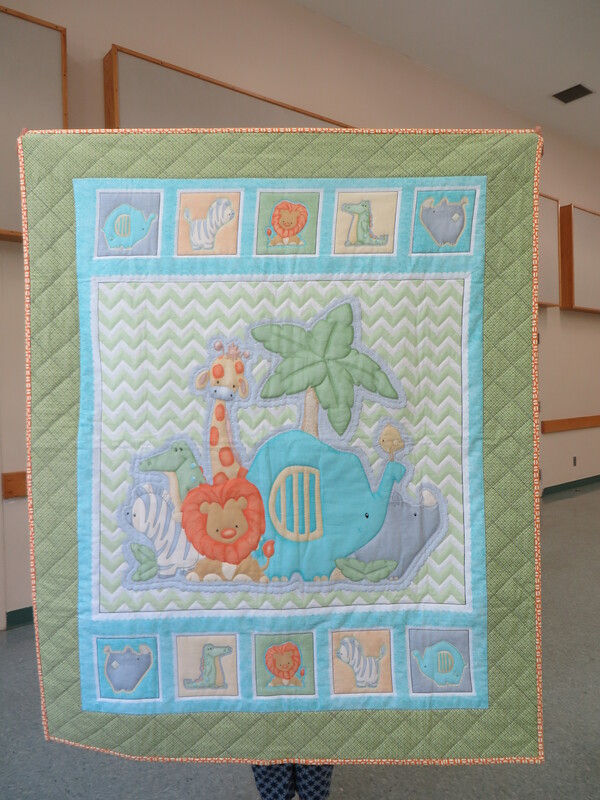 The next crib quilt is On Safari. It is 43×50”, of printed material, with a pieced border. It’s a Girl! 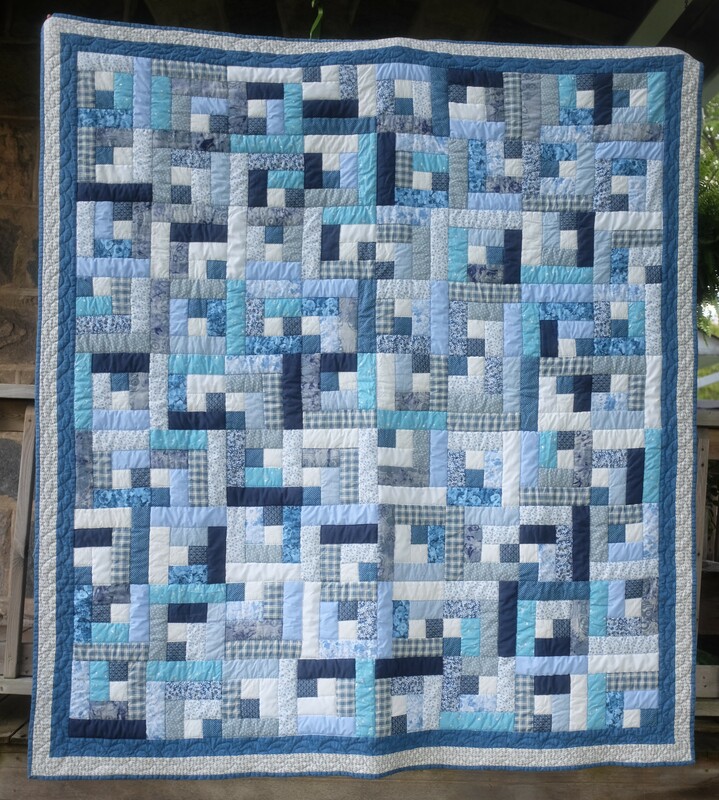 Well, really this is another crib quilt. It is 38×50”, printed material, pieced border. 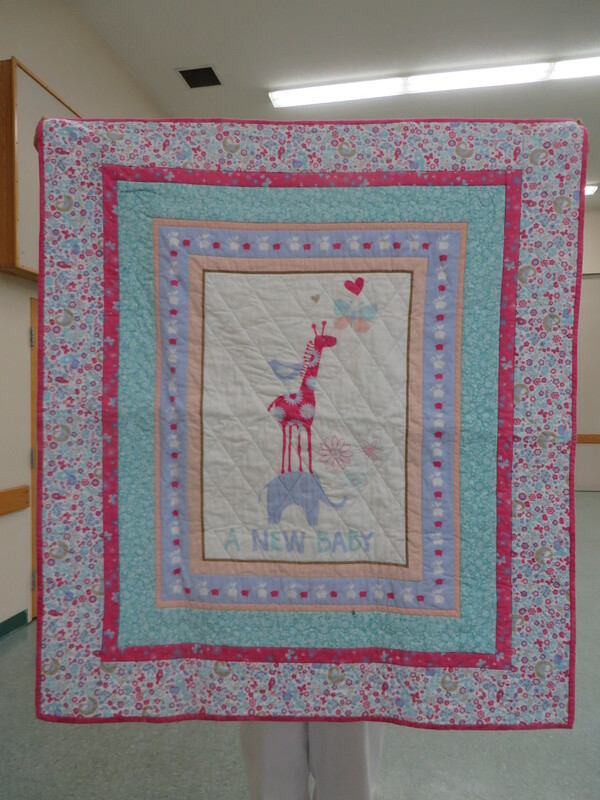 The A New Baby crib quilt measures 35.5×40”. Like the othes, it is of printed material, with pieced borders. However, this is flannel, machine quilted, and cotton batt. 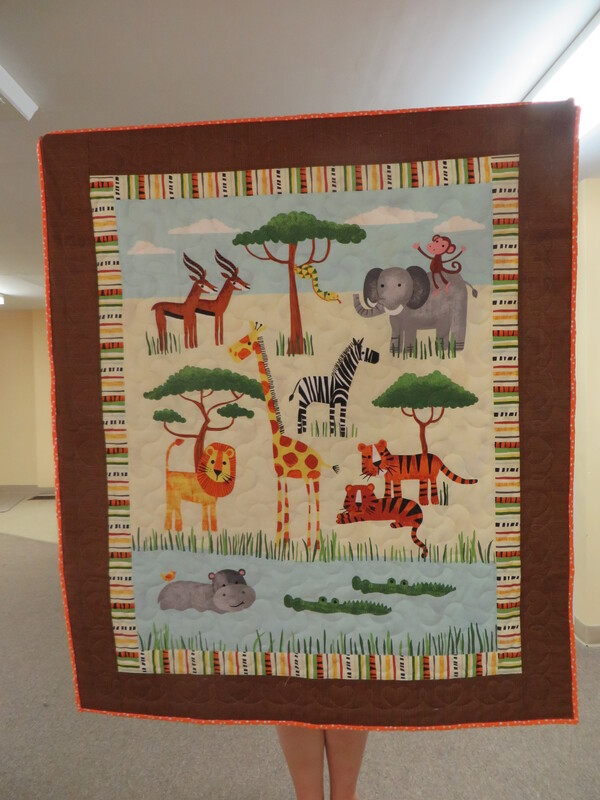 This Sweet Safari crib quilt measures 41×51”. It is printed material with a pieced border. Let’s get out of the crib to admire this Vintage 9 Patch set on point. 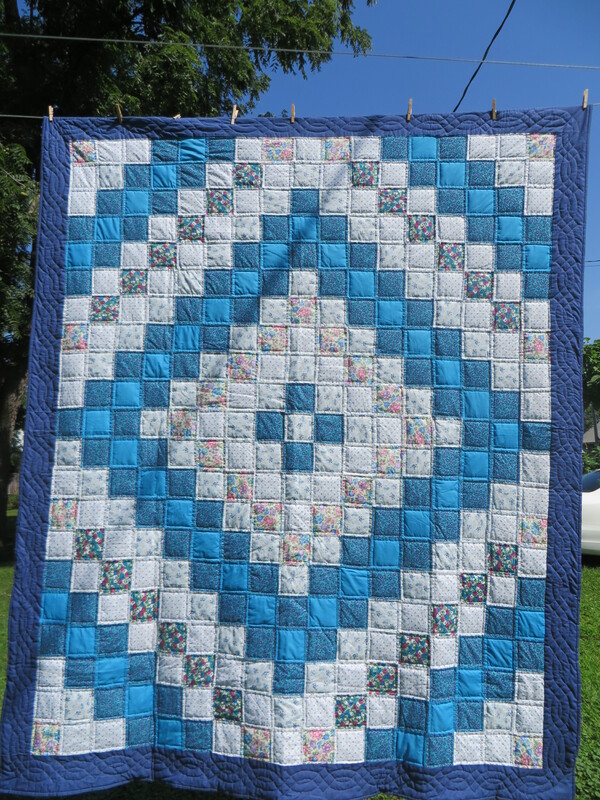 It is 69×82”, and pieced. 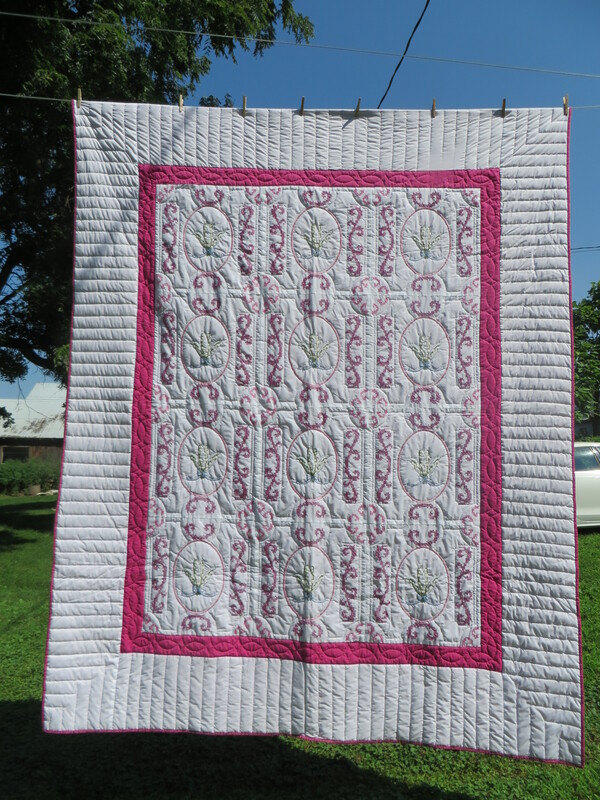 Note that the word “vintage” means “a new vintage top, quilted in 2016”. We uploaded more pictures on August 27, 2017. 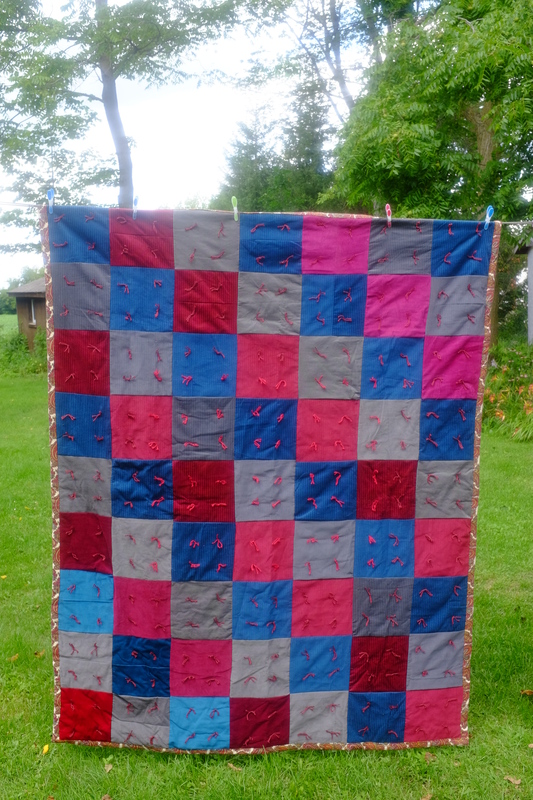 Here is a Tied Comforter, made of t-shirt material, pieced and tied. It is 58×83”. The next is a Red and Rust Corduroy Comforter, which measures 68×82”. It is pieced and tied. We follow that with a somewhat similar Beige and Brown Corduroy Comforter, 64×81”. It is also pieced and tied. 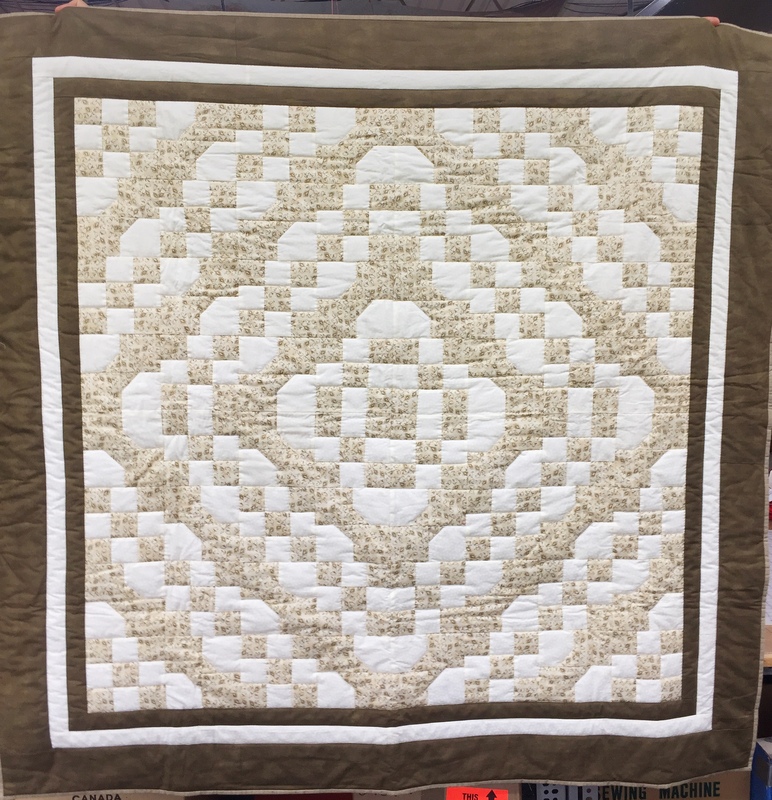 Beige and Brown Corduroy Comforter, 64×81”, pieced and tied. 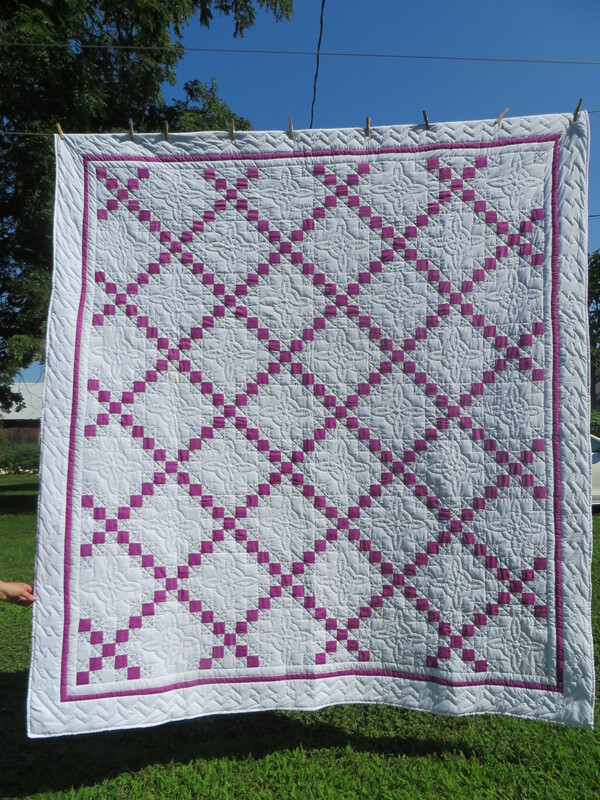 Here is a mauve Irish Chain quilt. It measures 88×96”. 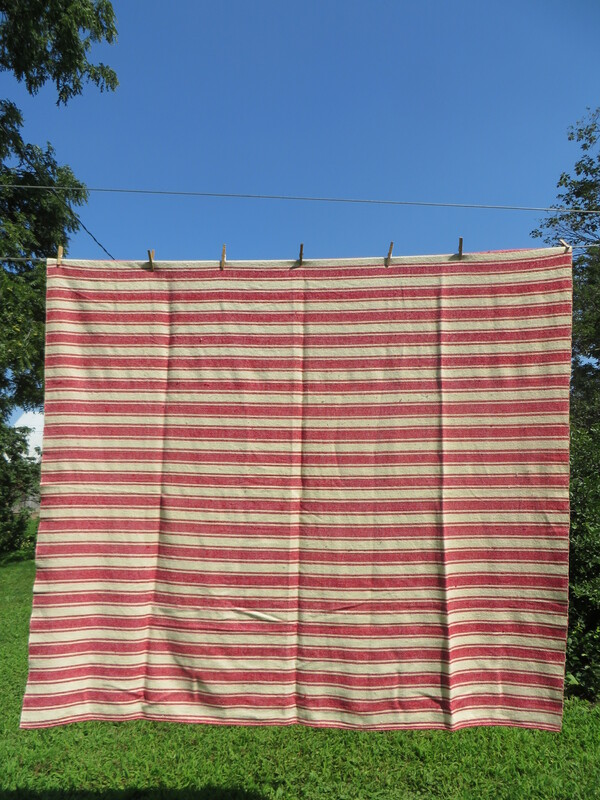 Next is an Amish Churn Dash, measuring 92×101”. Are you feeling blue? These Camels and Elephants from Goa quilt should cheer you up! It measures 80×83”. It’s made from whole cloth, with the design printed on. 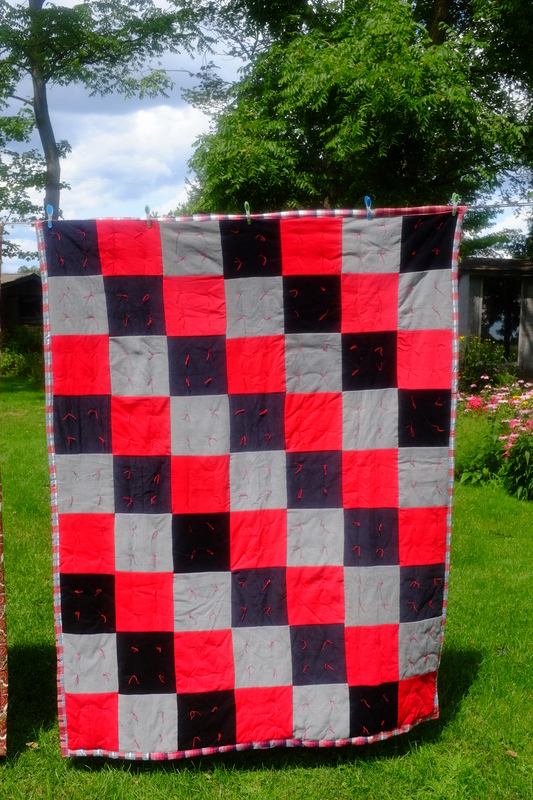 Here is a versatile Pieced Crib Quilt or Junior Quilt. 57×75”. 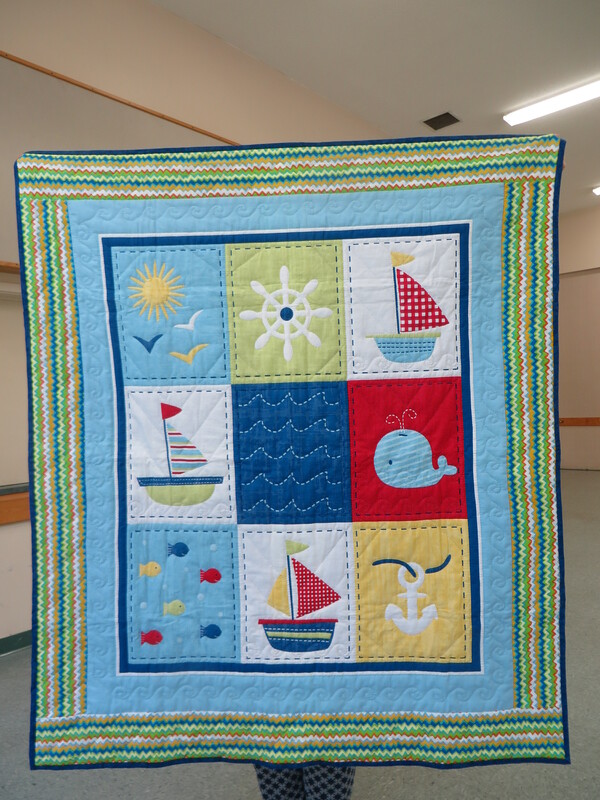 This quilt has an amazingly colourful border for the Pieced Crib Quilt Sailboats design. It’s 49×53”. 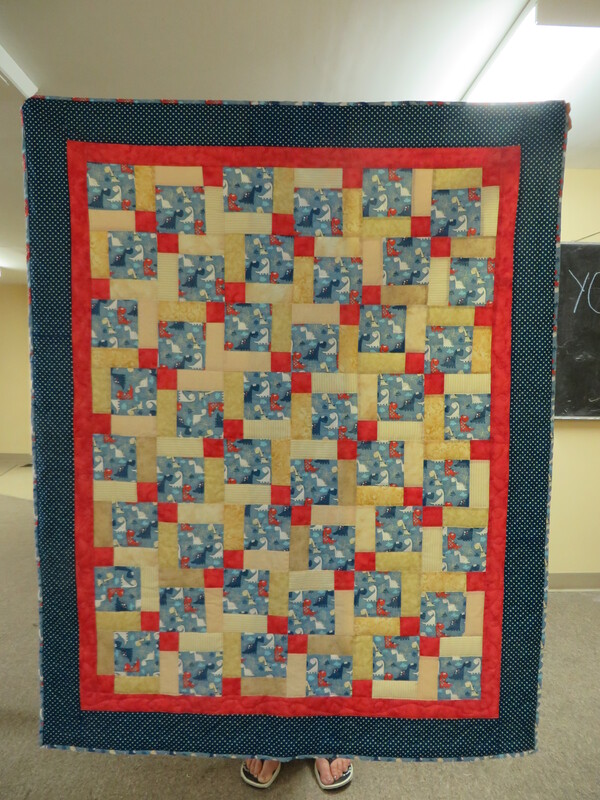 This is Carries Choice, a pieced crib quilt, measuring 47×64”. This design is called Sunshine and Shadow. It is 70×80”, and also is pieced. 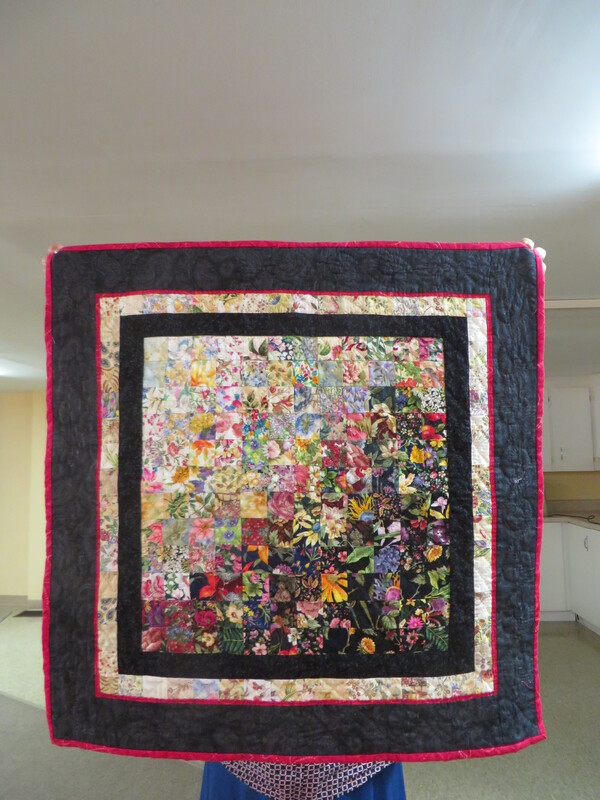 Embroidered Lilies is 82×86”, pieced, and embroidered (just as the name implies!). 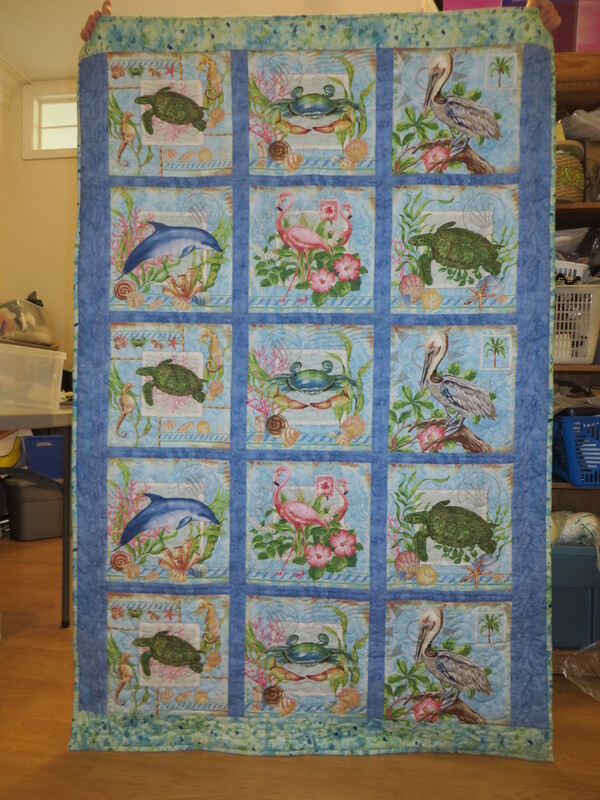 The sixty-second quilt in the 2017 auction is Trip around the World, a pieced quilt measuring 82×102”. The following quilts have been used. This Bow Tie design covers 64×70”. It’s up for auction “as is”: it’s well used but with some worn areas. 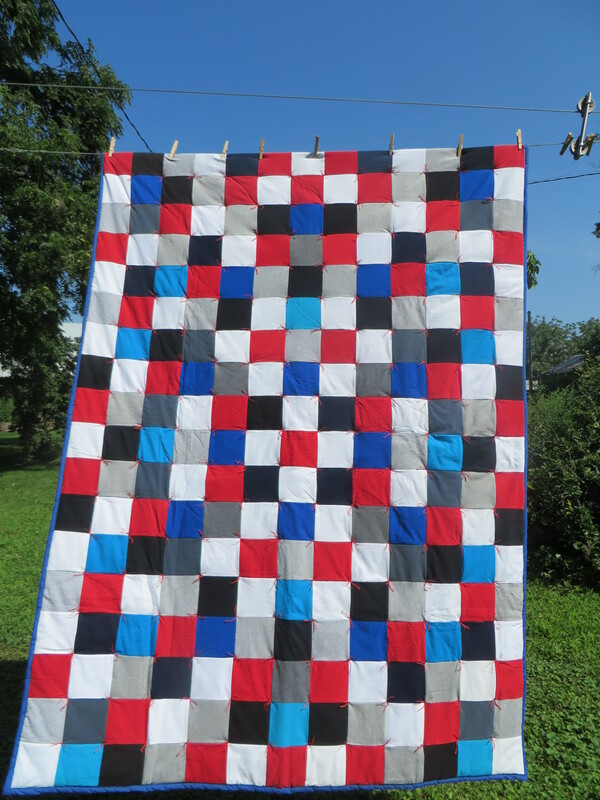 This Strip Quilt is 70×88”. It has seen very light usage, if any, and looks “like new”. 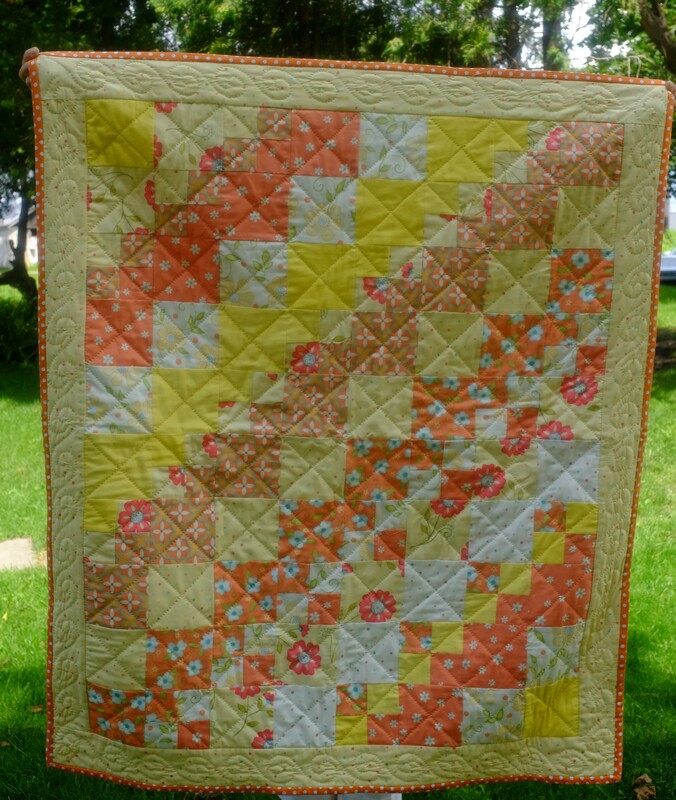 The pattern is an all over zig zag quilting design. 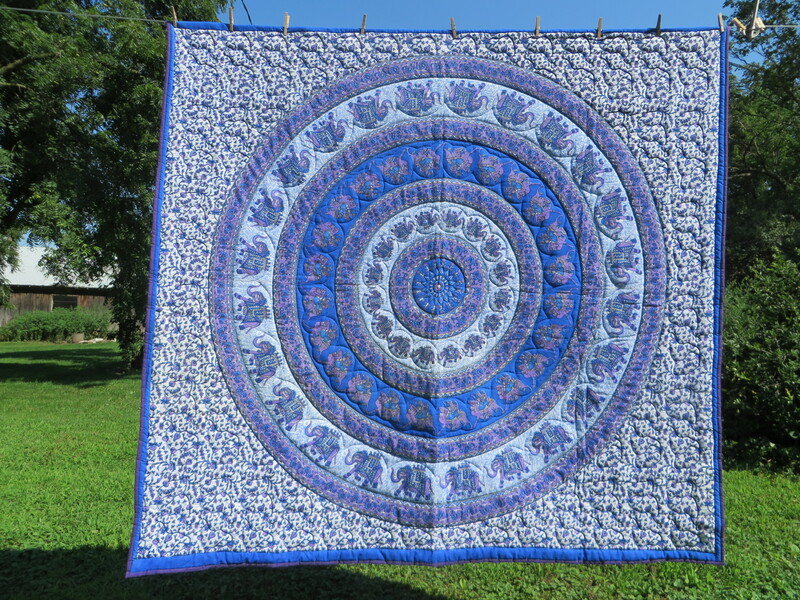 Here is a used Tied Blue Sateen Comforter, with print. It’s 88×96”. Yes, it is used, and is missing some ties. The thick batting may possibly be wool. This comforter has never been washed. Tied Blue Sateen Comforter, with print. 88×96”. Used, missing some ties. The thick batting might be wool. This comforter has never been washed. Here is another odd name: a Green and White Drunkards Path. 64×70”. Used, and as is. Green and White Drunkards Path. 64×70”. Used, and as is. Such an appropriate name: Red Whole Cloth. 70×78”. 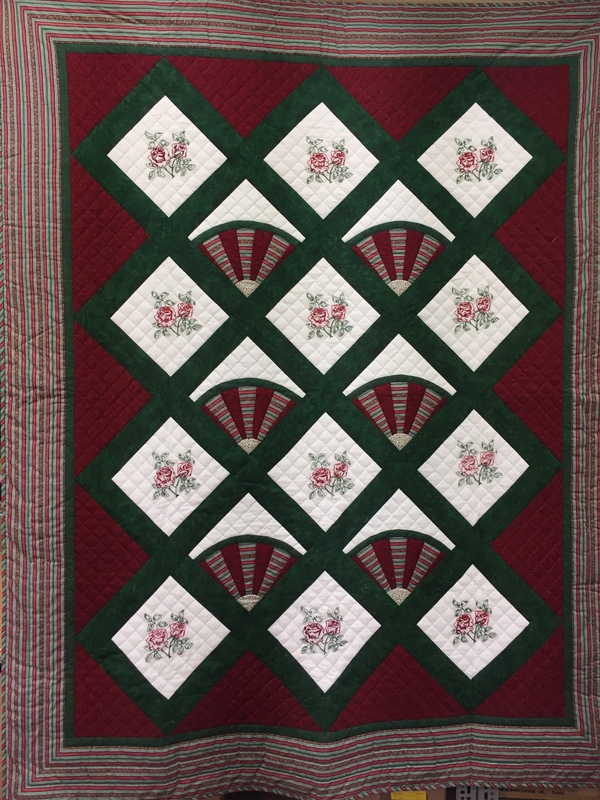 Used but looks new, It has Baptist fan quilting on the sides with diamonds through the center. It has a light weight flannel back. Red Whole Cloth. 70×78”. 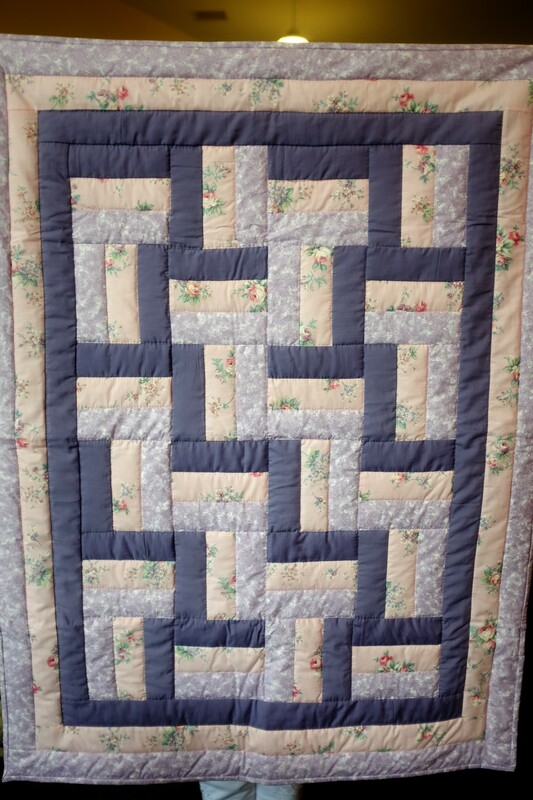 Used but looks new, It has Baptist fan quilting on the sides with diamonds through the center. It has a light weight flannel back. 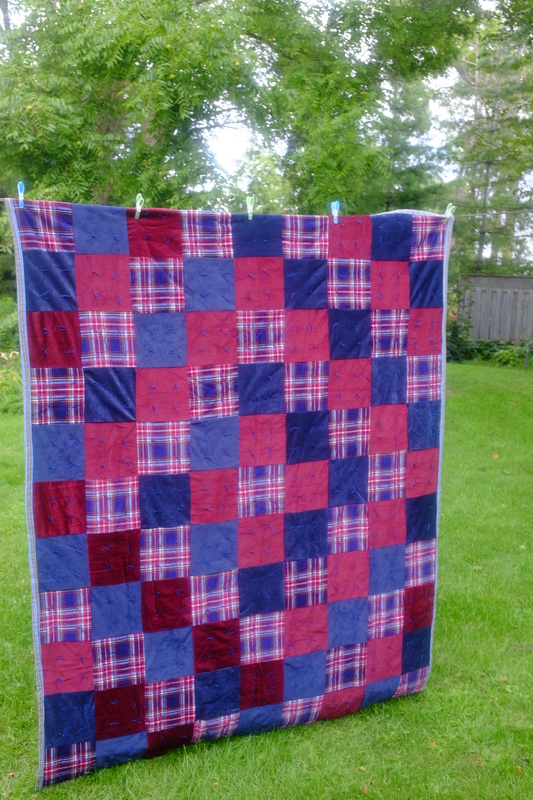 The next two used quilts are probably from a weaver in Jordan Station, Ontario. 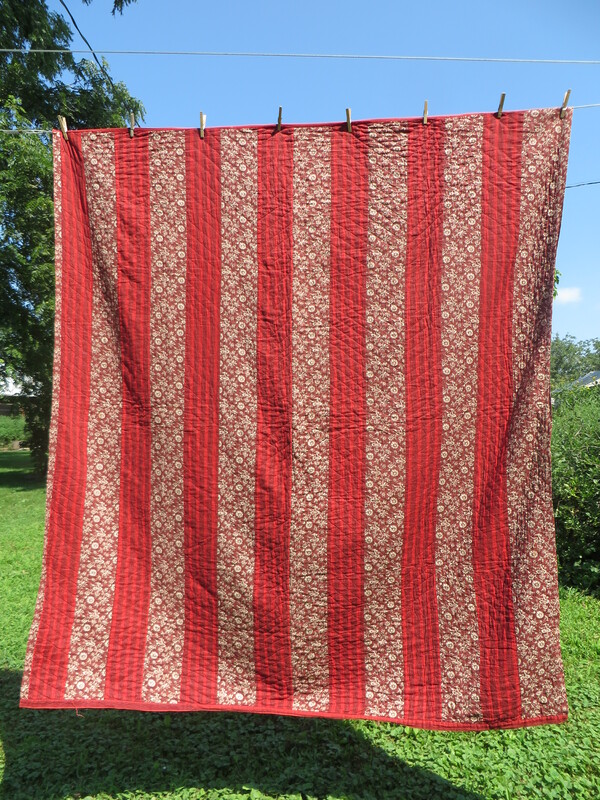 The first is a Red and Cream Hand-Woven Blanket, Measuring 65×70”, it is gently used. 68_Red and Cream Hand-Woven Blanket_8321. 65×70”, gently used. 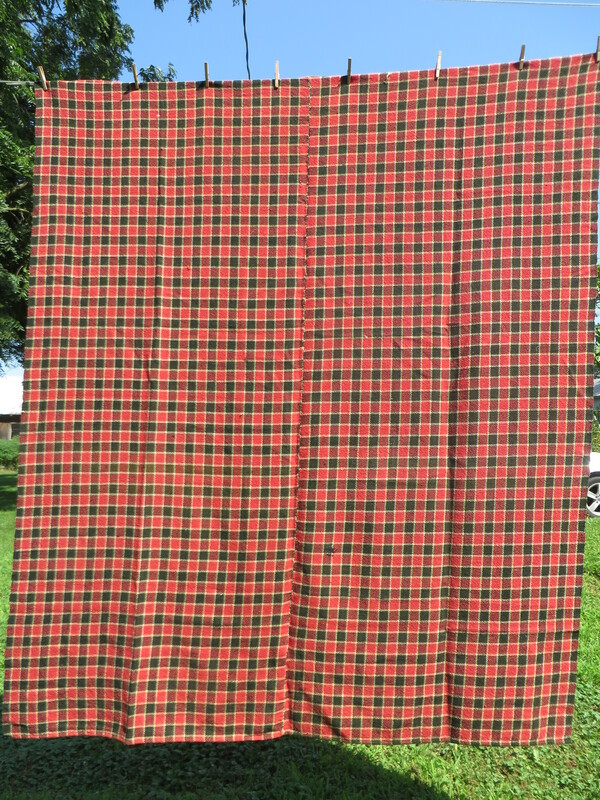 The second is a used red, black, and yellow plaid woven blanket, measuring 74×88”. We will auction it “used and as is”, with a couple of mended areas and some holes. Red, black and yellow plaid woven blanket. 74×88”. “Used and as is, with a couple of mended areas and some holes”. See you at Black Creek Pioneer Village on Saturday September 16, 2017.